In the Big East, Villanova is looking to bounce back after another disappointing March, while St. John's wants to build momentum with new coach Chris Mullin. With spring recruiting having closed and nearly every transfer player in place, SI.com is here to catch you up on the state of each conference heading into the summer. So far we’ve covered the AAC, ACC and A-10. Now, the Big East. Villanova went 33-3 in 2014-15 and won both the Big East regular season and tournament championships, but the Wildcats' season ended with a March under-performance for the second consecutive year. The team logged heady early-season wins over Syracuse, VCU and Michigan, climbing to a 12–0 record and a No. 6 ranking in the AP poll. The Wildcats won all but two Big East games and ended the regular season with a 37-point blowout of St. John’s. But after earning a No. 1 seed in the NCAA tournament, Villanova fell to North Carolina State in the Round of 32, the second straight year they'd failed to make it out of the Big Dance's first weekend despite being a top-2 seed. In May, the Wildcats lost arguably their three most significant contributors, as JayVaughn Pinkston and Darrun Hillard graduated and Dylan Ennis transferred to Oregon. The departures clear the way for a returning triumvirate to lead the Wildcats this winter. Look for senior guard Ryan Arcidiacono, who logged the most minutes of any player on the 2014-15 roster, to progress from being a big-shot-hitting role player to the architect of the team's offense. His primary target in the post is 6’11” senior Daniel Ochefu, who averaged 9 points and 8.5 rebounds per game during the 2014-15 season. Junior Josh Hart could very well form the third pillar of the offense. A 6’5” marksman, Hart averaged a quiet 10.1 points and 4.5 boards for the Wildcats last season—​but he's an elite offensive threat. He made north of 46% of his three-point attempts last year, had an effective field goal percentage of 62.2, and his offensive rating of 125.3 ranked 27th nationally in Ken Pomeroy's database. Hart and Arcidiacano will be joined in the backcourt by blue-chip recruit Jalen Brunson, a five-star guard who once scored 56 points in a high school contest against an opposing team led by Jahlil Okafor. After Ochefu in the post, however, there are only two other big men on the roster. Both are largely untested: 6’8” junior Darryl Reynolds, who averaged five minutes and 1.4 points per game last season, and 6’8” incoming freshman recruit Tim Delaney, a three-star pick up New Jersey. With the return of sophomore guard Phil Booth, as well as two valuable swingmen in redshirt freshman Mikal Bridges and rising junior Kris Jenkins, Villanova is well-stocked to score outside of the paint. How they perform inside could determine how the Wildcats stack up against not only against Big East foes, but also against the non-conference challenges that will inevitably stand between them and a postseason run. Any program that hires a new coach is making a “notable” move. The expected payoff of that move, however, is usually a few seasons away, once those coaches have instilled their own recruits and imbued their own philosophy. The Red Storm's hiring of former program legend Chris Mullin to succeed Steve Lavin is one exception to this rule. Of the Red Storm’s six most utilized players in 2014-15, four have graduated, and a fifth, rising junior Rysheed Jordan, struggled with academic eligibility and will not return to the team in 2015-16. That leaves only 6'10" senior Chris Obekpa (he of the short shorts) for Mullin to mold into what has to be a new core. Indeed, one of Mullin's foremost challenges will be improving the rebounding of a team that finished 306th in rebound margin last season. In just two months on the job, though, Mullin has brought in an astonishing seven players, six of whom are immediately eligible. (Tariq Owens, a transfer from Tennessee, will have to sit out the 2015-16 season per NCAA rules.) Freshmen competing for playing time include four-star guard Marcus LoVett Jr. and guard Malik Ellison. Then there's 6’11” center Yankuba Sima, who arrives at St. John's from Spain via Florida's Arlington Country Day School and who chose the Red Storm over a Maryland program that's on the rise. Graduate transfers Ron Mvouika (Missouri State) and Durand Johnson (Pittsburgh) could add depth for St. John's at the guard and wing position, respectively, as could junior college wing Darien Williams. Unlike Lavin, a West Coast lifer who never quite fit in at St. John’s, Mullin also has the full backing of the school and Red Storm fans. It’s unclear how successful St. John’s will be in 2015-16 during a time of significant flux—athletic director Chris Monasch left last month after reportedly being forced out—but after just one off-season, the Red Storm will be virtually unrecognizable from the Lavin Era. This is Mullin’s team now. 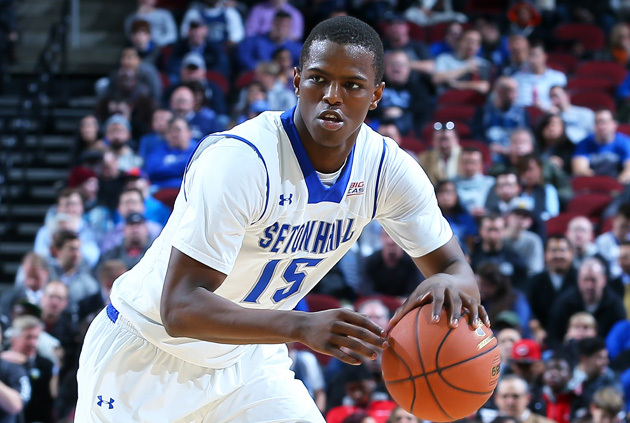 Seton Hall’s 2014-15 campaign was its best season in years—until suddenly it wasn’t. The Pirates started 13-3 and jumped into the AP top 25 in January, marking their first ranking in three years. Then, out of nowhere, the team ended the season by plummeting, going 3-12. The lone silver lining in this scenario was that the Hall could potentially have a do-over in 2015-16. The program only graduated one key contributor, forward Brandon Mobley, and landed a significant addition in Massachusetts transfer Derrick Gordon, a guard who is eligible to play right away. All of which makes the transfer of team-leader Sterling Gibbs (16.3 ppg) to Connecticut such a crushing blow. Gibbs was a serious contender for Big East Player of the Year in early January, but the Pirates' slide and Gibbs two-game suspension in February for punching a Villanova player ended that discussion. Gibbs’s departure, along with that of former top-100 recruit Jaren Sina, who left in April for George Washington after Gibbs flew the coop, underscores the difficulties coach Kevin Willard has had within his own program. Rising sophomore guards Isaiah Whitehead and Khadeem Carrington will each bring a valuable year of experience to the table. Granted, some of the motivation for Gordon choosing Seton Hall is believed to be the playing-time role Gibbs' departure provided. But, had Gibbs stayed, he and Gordon would have rounded out what would have easily constituted one of the Big East’s best backcourts. Now, a team still dazed from losses and chemistry issues will have to find a way to contend without its best player. Butler: The Bulldogs have long thrived on fundamentals and consistency. Now that coach Chris Holtmann has gotten the job full-time after navigating the program through the absence of predecessor Brandon Miller, the Bulldogs need to do what they’ve already done for many seasons: play efficient defense, slow games down and limit opponents’ scoring from three-point range. Creighton: The Bluejays are coming off the school’s first losing season in 19 years, largely due to defensive lapses that allowed opponents to score more than one point per possession. Returning post players Geoffrey Groselle, Toby Hegner and Zach Hanson can bring some much-needed experience to the front line but Creighton has to get more pressure on opposing guards. That the team spent its postseason-less April working exclusively on defense can only help. DePaul: In the final four seasons of the morose Oliver Purnell experiment, DePaul won 12, 11, 12 and 12 games, respectively. Dave Leitao, who took the Blue Demons to their most recent NCAA tournament in 2004, is back in charge. To fare better than Purnell did he needs to go beyond merely restoring enthusiasm to the program and find a way to break into Chicago’s fertile recruiting ground. ​​Georgetown: The Hoyas' season will hinge on the play of guard D'Vauntes Smith-Rivera, who has led the team in points per game for two straight seasons and who unexpectedly elected to return for his senior campaign. In addition to his scoring, he needs to distribute the ball to a pair of promising post players, emerging star sophomore Isaac Copeland and incoming top-50 recruit Jessie Govan. Smith-Rivera alone won't be able to get Georgetown to its first Sweet 16 since 2007. Marquette: Coach Steve Wojciechowski endured a 13–19 debut season in Milwaukee, but he has a top-five recruiting class coming in for his second year with the Golden Eagles, headlined by center Henry Ellenson, who will join a roster with six current or former top-100 recruits. The challenge for the former Duke assistant coach will be translating that talent into success on the court. Providence: With the transfer departures of Tyler Harris and Pascal Chukwu, as well as the graduation of LaDontae Henton, this team now belongs to junior guard Kris Dunn. Coach Ed Cooley has now guided the Friars to consecutive NCAA tournament berths after the school had previously only made the Big Dance once in the past 17 seasons. Getting back for a third straight year could be difficult unless Dunn gets some help. St. John’s: Under Lavin, St. John’s offense often felt disjointed and spastic. This guard-oriented team of mostly new parts needs to find an identity under Mullin and play with cohesion. It’ll help the Red Storm significantly if big men Amar Alibegovic and Joey De La Rosa grow from benchwarmers into significant contributors. Seton Hall: After the Pirates' implosion this past season, Willard needs to get his players united, motivated and better conditioned to respond to adversity. Seton Hall doesn’t have the talent to necessarily coast to wins in the Big East, but it can still easily compete for them. This is an important year for Whitehead and Carrington. Xavier: While Xavier is traditionally solid and always seems to perform at its best in March, coach Chris Mack missed on a few graduate transfers this offseason that could have added depth behind point guard Myles Davis. Ergo, the Musketeers’ biggest question mark in 2015-16 is its backcourt. Another key for Xavier will be the development and utilization of wing Trevon Bluiett and big man Jalen Reynolds. Villanova: An overreliance on three-pointers was part of the Wildcats' undoing during the NCAA tournament this season. In addition to establishing an inside presence beyond Ochefu, the Wildcats would be well-served to encourage more dribble penetration and two-point shot creation from their guards. Brunson can be a catalyst in this regard.